Welcome to the St. Peter Spirit Store. Please be sure to include your child's name and homeroom with your order so that we can deliver your items to you. 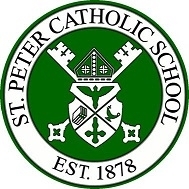 If you are a friend of St. Peter school making a purchase, please wait for an email confirmation that will let you know when you can stop by our front office to pick up your item(s). Please allow at least one week for delivery of in stock items. **We are taking preorders for out of stock sizes of our new Green Roadrunner t-shirt and White Long Sleeve Roadrunner t-shirt. Deadline to order is December 4th. Allow 2 weeks for delivery. Please be sure to put your requested size in with your order. Deadline to order is 12/4. Allow 2 weeks for delivery.